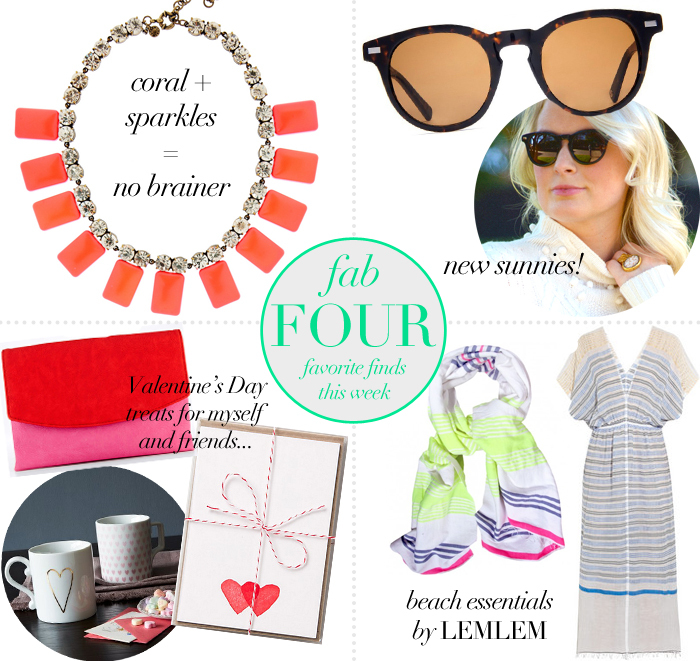 This J.Crew coral + crystal necklace is the perfect balance of color and sparkle. It’s going to look amazing with all my neutrals and whites for spring! Best part about it? It’s under $100. Thanks to Warby Parker for these cute Jasper sunnies – I scored them at the Dry Bar event on Saturday and have been wearing them ever since. While I’m still enjoying the cold weather and getting to wear cozy clothing, my eye is on spring with several fun trips coming up (Bahamas, specifically), and nothing makes me think “beach” more than these light and breezy pieces by LEMLEM. This dress will act as an amazing cover-up by the pool or on the sand, and this towel is such a fun mix of shades and will be easy to spot when coming back in from the surf. With Valentine’s Day coming up and no S.O. in sight (significant other, that is), I’ve decided to treat myself with a few little gifts. This Ann Taylor clutch screams Valentine’s Day – hot pink, red, need I say more? PS – it’s only $48!! These heart mugs from West Elm are a cute addition to the collection I’ve been growing since my recent affinity for tea. I plan to use these cards to write my friends cute little notes before V-Day. Love that clutch!! So perfect for Valentine’s! That long caftan is absolutely gorgeous! Definitely on my summer list! Yup, I love the clutch…great price! soo good – what are you getting your friends for V-Day? I’ve been on a clutch kick lately and that red and pink one is so beautiful! I love those mugs too — a little gold goes a long way. Great roundup! I’m super into Lem Lem right now- so pretty! And I always buy myself a Valentine’s Day present to help me feel less alone ha. I like to buy perfume or a fancy candle. love the ann taylor clutch, every girl needs that for vday!